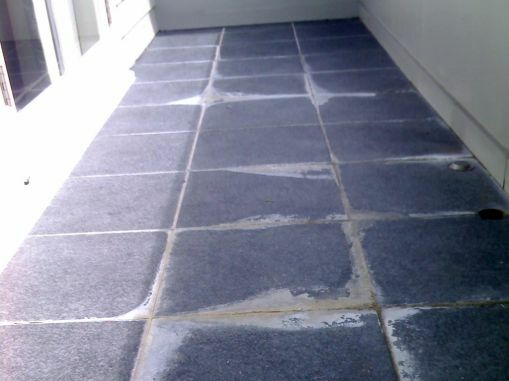 A build-up of mostly white crusty salts on grout lines, or on the surface of tiles, is called ‘efflorescence’. 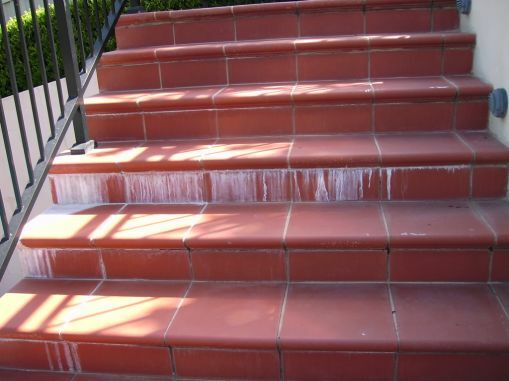 This also often occurs on the front of steps where water seeps out, leaving salty streak marks. 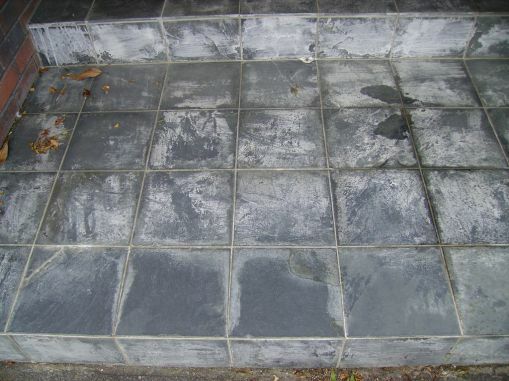 Efflorescence is caused by water entering the tile bed and picking up soluble salts from the substrate. This salt solution is carried to the surface through the porous grout lines, where the water evaporates and leaves the salt residues behind. Successive wetting will create a continuing build up, with a heavy crusty effect similar to that seen in limestone caves (stalactites and stalagmites). Sometimes the source of the salts can be the use of unwashed sand in grout, but most often comes from the substrate. Is it possible to remove efflorescence? 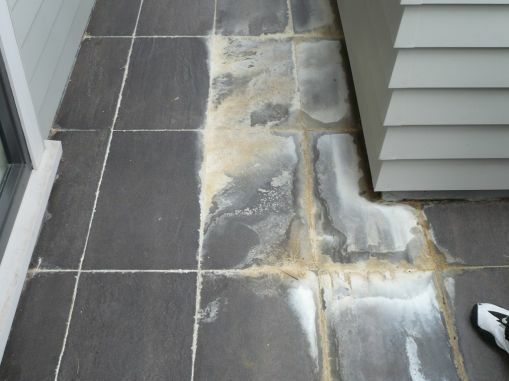 A De-Calcification treatment can remove efflorescence (the visible salty crusts) and help to prevent recurrence, but it cannot solve the problem and it is likely to recur at some stage. Prevention is far better - only used premixed grout (never unwashed sand) and isolate the source of salts (substrate) from the tiles by quality waterproofing agents. 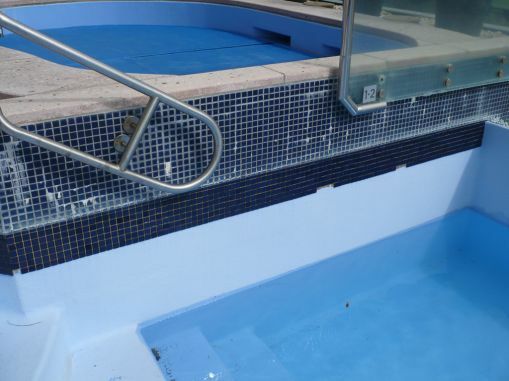 In heavy and recurring situations, efflorescence removal from the surface is only temporary and prevention through regrouting may be required. 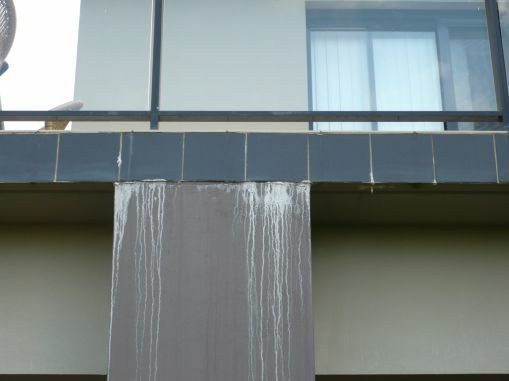 If you have efflorescence, you can book a free Slique Consultation – we’ll come and confirm your problem, and give you a quote for our Technicians to professionally restore the surface to as-new condition.